Circus Performing Arts Taster – 22nd July – Book Now! Sense have partnered with the Hangar Arts Trust to hold a taster session at their base in Woolwich. Bungee – A fun aerial activity where participants will be secured into a harness and enjoy the thrill of being lifted into the air, perhaps attempting a few somersaults whilst on the move!! Silks – An aerial skill where silks are used around the body to wrap, suspend, fall, swing and spiral you into various positions. Aerial Silks can be used in many ways, for beginners initially acting as a cocoon enveloping the body to form a fabulous swing. Hula Hooping – a great fun way to keep fit, get to feel the rhythm of the hoop and concentrate on trying to keep it from falling!! Participants can come along and try whatever skills they feel comfortable with, the above selection should include something for everybody from the thrill seeking and daring to those just wanting a taste of something different!! Why: To encourage individuals with sensory impairments to be active and to try new opportunities out of their comfort zone! As with all free funded sessions we need to capture some information to justify the expense to our funders and to support research for future opportunities. Anyone wishing to attend will need to complete a registration form which I will send out to you once you contact me to express your interest. There will also be a customer care medical form from the Hangar Arts Trust that needs to be completed. We know paper work is a pain but it’s for everyone’s benefit in the long run. We do have a limited number of spaces available for this taster session and a few are already gone so it will be on a first come first served basis. Don’t worry if you don’t get in though, because if we get enough interest I will look to hold another session later in the year. We endeavour to make our sessions as inclusive as possible, but regret we are unable to provide BSL or other language interpreters, therefore advise you to ensure you have support available to attend your chosen sessions if needed. Assistance dogs are welcome at any of our sessions, however coaches and staff do not have provision to supervise dogs, therefore they may be left unsupervised to the side of the session. A suggestion is to bring along toys and/or food to help prevent boredom. If you have any queries or concerns, regarding this please contact us further. I hope you’re as excited about these sessions as I am. Soft Brexit? Hard Brexit? Soft Boiled Egg? Hard Boiled Egg? Ah those hard choices – the first of which on Saturday was for the Devil’s captain who won the toss and with a team of eight, including a debutant, had to choose to bat or bowl first. He elected to put the visitors, who had one more player, into bat. A brief delay followed the toss waiting for the final Gloucestershire players to arrive. The game began on a day where the clouds were skidding past overhead quite fast on the breeze and the sun only flickered in brief spells, so perhaps with conditions to suit the bowlers. However, the three first choice bowlers in the side were played well by the Growlers opening pair who put on 79 for the first wicket, with no alarms. It was not until Brenda was thrown the ball that a wicket fell – clean bowled from her fourth delivery, and then one brings two. In her next over, fifth ball, the same result. That was a high point for the home side as this brought the visiting skipper to the crease, who was joined by a new batsman only as the second opener retired on 52, so that by the time the Devil’s skipper bowled his third over and picked up another clean bowled wicket the score had moved on to 184. The Devils were under pressure – relieved only a little by the retirement of the opposition captain as the Growlers pushed hard to take runs at every opportunity with their wickets in hand. It made for a frantic few final overs and three run outs for the home side before a declaration with the score on 226; with the visitors deciding not to put their retired batsmen back into the middle. Tea followed, excellently organised by the home captain, in the absence of the regular catering team and the Devils had one of those choices – chase 227 from 26 overs to win, or bat out 26 overs for a draw – a losing draw, of course, in a Regional League match. With Aemonn and Dave opening it looked as if the challenge of chasing down the total had been taken on. Growlers started well with a tight first over yielding just one run and disaster struck on the third ball of the second bowled by Marc, and perhaps one choice disappeared for the Devils. Dave let a ball go outside leg only for the blustery wind to bend it back in and caress the stumps or their base and the home team were three for one. David and Aemonn dug in, with David hitting the ball well but was bowled when Dan, the Growler’s high-scoring opener, came on to bowl. There was then a brief flurry from the Devils as Everton hit a very brisk 17, all but one single in boundaries only to then offer a catch to who else but Dan. Brenda joined Aemonn and the choice of batting out seemed back in favour as runs were accumulated with few risks being taken and the next wicket did not fall until the start of the twenty-second over when she trapped leg before by, yes, Dan; Aemonn having retired on reaching 50. So four down and twenty-nine balls to negotiate with three wickets in hand. However Joseph on debut misjudged his swing second ball and clipped the stumps bringing Hasmukh to join Roy with the momentum having swung to the visitors who now needed two more wickets from twenty-seven balls. Roy was trapped LBW by Elise in the next over and so Aemonn had to return to the middle and now there were nineteen balls to bat out; single taken. Panic was now setting in for Gloucestershire as their minibus driver appeared and the departure time of six 0’clock had just passed so there was a rush on to bowl three overs, or less if possible, as fast as they could. Aemonn faced two, and Hasmukh four of the next over. Aemonn faced four in the next over and gave Hasmukh the last two. So the choice was set, would it be yours – to have the hard hitting Aemonn on 59 from 53 balls to face the last over, or the soft hands of Hasmukh who had only faced seven. Regular followers of Metro cricket will recall the heroic defence shown by Hasmukh in snatching a draw from the jaws of a defeat at the cradle of cricket last season and so might have wanted to make use of this experience, especially with Dan bowling the last over. They may have been right, who knows, as the Growlers were celebrating after just one ball as a swing and a miss to a straight ball brought him a fourth wicket to add to his 52 and a catch. So ended a close fought and very friendly game. Two away games for Metro follow at Nottingham and then to Sussex for the BBS cup, while the next game at Highgate sees the Devils take on the Berkshire Stags. Mini Futsal Sessions starting on Saturday 8 July with Tottenham Hotspur Foundation! Mini Futsal Taster Session followed by 6-8 week programme! The Metro Pairs Bowls Tournament was held on Saturday the 17th of June 2017. I am pleased to report that our 4 new members Junette, Constance, Wilbert and Gause all took part and did very well. This year we had 6 pairs, so we had a Round Robin, which meant each team had 5 games. It was a lovely hot sunny day, with the first round of games starting just after 10 o’clock, after a minute silence for all the people killed in the Grenfell Tower disaster, and for some of our bowling friends. It was a bit disappointing that I could only get 1 marker, as we had 3 games on each session, so the bowlers had to mark their own games. All the pairs seemed to be closely matched, as the scores in the games were close. After 4 rounds, with only the last one to go, 3 pairs had won 3 of their 4 matches so we didn’t know who was going to win. After the last round, Junette and Maureen came first as they had won 4 out of 5, with Amit and Wilbert second just in front of Gordon and Steve by 2 shots. Susan, the Ravenscourt Park bowls secretary, kept us well supplied with teas, coffees and cold drinks. 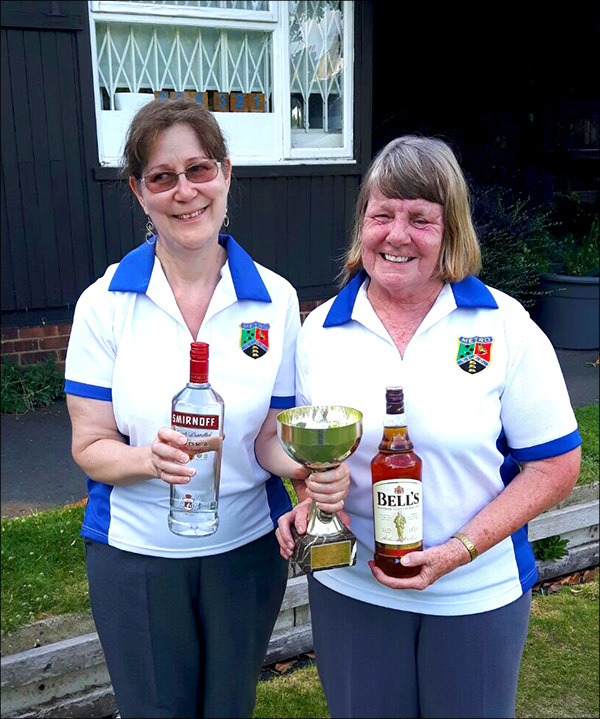 After Eric had presented the cup and large bottles of whisky and vodka to the winners Junette and Maureen, and bottles of wine to the runners-up Amit and Wilbert all went out and had a few photos taken. We then all went off to the local Wetherspoon pub, where a room had been reserved for us, and had a jolly evening. Fortnightly Table Tennis – Polybat – Bromley-By-Bow Centre! “I had 2 hours of fun playing singles and doubles. Very suitable for blind and partially sighted players. There are 2 tables adapted. I introduced a yellow tennis sound ball and some of the players enjoyed the new experience as the ball seemed to roll better. Date: Fortnightly on Tuesdays (apart from xmas holidays) Time: 14:00 -16:00.